You can log on to the Clearinghouse secure site to see when your enrollment information was sent to NSLDS. On the “Student Reporting” tab, select “Enrollment Reporting” and then select the “NSLDS Reporting” tab. This will display a summary of the enrollment data reported to NSLDS by the Clearinghouse on your behalf, as shown in the image below. You can use the Clearinghouse secure site to find out when your school’s enrollment information was sent to NSLDS. The rows with “NSLDS” listed in the “Originator” column show when the Clearinghouse sent your enrollment information to NSLDS via the SSCR process. The Clearinghouse has a schedule in place that shows when an SSCR Roster is due from NSLDS for your school every month of the year. Typically, we receive SSCR Rosters within the first few business days of each month and, once received, begin processing them almost immediately. If the Clearinghouse receives and processes new information from your school between the 3rd and 11th of the month, we may opt to re-process the original SSCR in the middle of the month (this is the mid-month SSCR process). 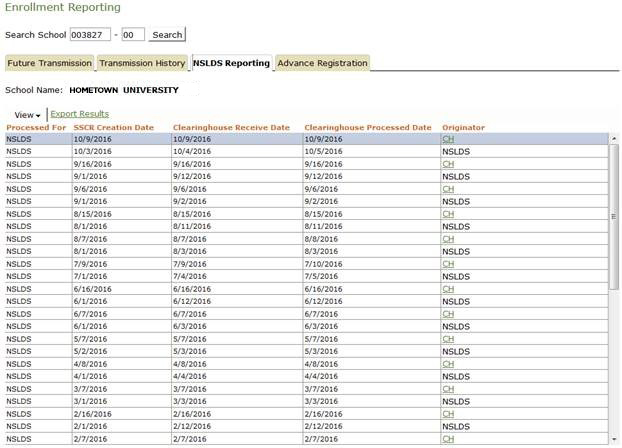 The rows with “CH” listed in the “Originator” column are associated with our Supplemental SSCR Roster Reporting process, whereby the Clearinghouse requests that NSLDS add students to your SSCR Roster. This process, which the Clearinghouse implemented in December 2015, helps ensure that students who should be on your SSCR Roster are added. As part of our Supplemental SSCR Roster Reporting process, whenever the Clearinghouse receives an updated status from you for a student, we check to see if that student has been on an SSCR Roster for any school during the past 10 years. If the student has appeared on an SSCR Roster within the past 10 years, and is not currently listed on your SSCR Roster, the Clearinghouse will request that NSLDS add the student to your SSCR Roster. You can review the students the Clearinghouse is requesting NSLDS add to your SSCR Roster by clicking the “CH” link in the “Originator” column and then selecting the “Students to be Added” tab.